Back in the days when mere mortals could afford housing in San Francisco, I lived there for several years; it’s also where I met the woman I’m now married to. San Francisco has a large and vibrant Chinatown, and as an avowed fan of Chinese food, I was delighted to learn that fortune cookies were invented there. (If you visit, be sure to stop by the Golden Gate Fortune Cookie Factory, where you can see the cookies being made by hand.) Morgen and I even had a San Francisco-themed wedding. In addition to a San Francisco-shaped wedding cake, we got a bunch of those cardboard Chinese take-out containers, filled them with treats, and distributed them to our guests. Among the goodies was a custom-made fortune cookie with a special message thanking guests for attending. As confections go, a fortune cookie is about the lightest dessert I can imagine, which is usually just what I want after a Chinese meal. I can’t recall ever having a fortune from a cookie come true, but there have been fortunes that gave me food for thought (so to speak), and even a patently goofy saying seems like a delightfully quaint way to end dinner. But the fortune cookie is an American idea that’s considered strange in China. Or, to be more accurate, it’s a Japanese invention that was adapted for Americans and then co-opted by Chinese restaurant owners. But I’m getting ahead of myself. There are several competing histories of the fortune cookie, none of which is entirely verifiable from recorded history. Many accounts trace the cookies’ origin back to 13th- and 14th-century China, which was then occupied by the Mongols. According to legend, secret plans for an uprising were hidden in moon cakes that would ordinarily have contained lotus nut paste, which was unpalatable to the Mongols. The successful uprising, planned with the help of the hidden notes, led to the formation of the Ming Dynasty. This story may be true, but I have seen no evidence that it inspired the treats we know of today as fortune cookies. 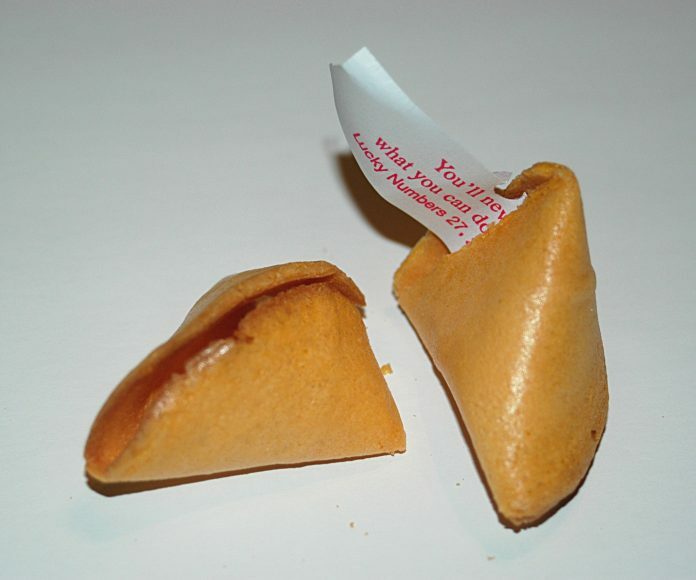 There can be no doubt that the modern fortune cookie design originated in California. However, there is quite a controversy over who actually invented it. David Jung, a Chinese immigrant living in Los Angeles who founded the Hong Kong Noodle Company, claims to have invented the fortune cookie in 1918—though no one seems to know where the recipe or idea came from. The alternative and generally accepted story is that it was invented in San Francisco by a Japanese immigrant. Makoto Hagiwara was the landscape designer who created the Japanese Tea Garden in Golden Gate Park. According to Hagiwara, the fortune cookie was based on a Japanese treat called Tsujiura sembei. He sweetened the recipe to appeal to American tastes, enclosed thank-you notes in the cookies, and served them to his guests with tea. Depending on which account you read, Hagiwara began distributing the cookies in either 1907 or 1914, but in any case they clearly made their appearance well before the 1918 date claimed by Jung. Within a few years, however, Chinese restaurant owners in San Francisco had copied the recipe, replacing the thank-you notes with fortunes. The rest, as they say, is history. Over time, the fortunes in fortune cookies have gotten sillier and more annoying. For one thing, they now almost always include “lucky numbers,” which coincidentally seem to match the pattern of lottery numbers. There’s also a trend toward smiley faces, which make me frown, and Chinese writing, which is just baffling considering the cookies’ origin. Even the fortunes themselves make less and less sense. Whatever happened to the simple “You will lead a long and prosperous life” or “Never eat fish on a Monday”? But when it comes to fortune cookies, I suppose an appeal to tradition is missing the point. Note: This is an updated version of an article that originally appeared on Interesting Thing of the Day on August 31, 2003, and then in a slightly revised form on October 3, 2004.